In late May, I traveled to Fordham University in New York for its annual Faculty Technology Day. The theme of this year’s event was “digital citizenship,” and we attended to explore what it means to be a digital citizen and how instructors on campus could help prepare their students to fill such roles. But I have to be honest – when I received the invitation I wasn’t sure what being a digital citizen actually meant. So… I turned to Wikipedia. According to the article on the subject, different definitions of a digital citizen involve “use of the Internet regularly and effectively,” and “the promotion of equal economic opportunity, as well as increased political participation and civic duty.” Whoa. That’s a tough ask. How many people do you know who use the internet “effectively” or as a “promotion of equal economic opportunity”? In my talk, I decided to answer that question. How can we help our students understand digital citizenship and provide them with a place to practice the effective usage of their access to information? 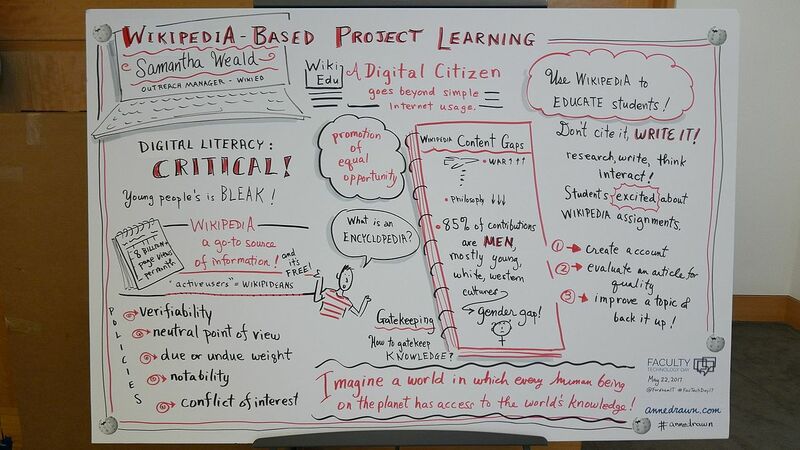 Creating digital citizens with Wikipedia-based project learning. Thanks to Anne Gibbons, conference Graphic Recorder, for this visual summary of my keynote. So what does this say about how well we’re preparing our future digital citizens? We must do better. In Fall 2016, we at Wiki Education did our own study. We wanted to know: were students gaining digital literacy skills through the Wikipedia assignment? Thankfully, yes! Of instructors surveyed, 96% said that a Wikipedia assignment was better for teaching digital literacy than a traditional assignment. That’s because Wikipedia requires all contributors to follow strict policies and guidelines in relation to how content is curated. So when a student is asked to complete this assignment, they are first asked to learn about Wikipedia’s policies for sourcing, reliability, and verifiability. They are asked to distinguish between high-quality, academic, peer-reviewed sources and opinion pieces or blog posts. Why? Because without that understanding, that work won’t stick. But for students to be true digital citizens they can’t just act as consumers of information. They need to become engagers and creators. That’s why the Wikipedia assignment is so great. It asks students to evaluate existing information on Wikipedia for content gaps in their field, to find out what research has already been published about that topic, and then to take active steps to rectify that imbalance. Students aren’t just consuming academic literature, they’re providing summaries, links, and access so that others can also benefit from their learning. When thinking about how we can prepare students to become digital citizens we first must recognize that having digital savvy students is not the same as having digitally literate ones. Then we need to take active steps as educators to seek out the problem areas – do my students know what a reliable source is? do they understand the difference between a primary source and a tertiary source? do they know how to identify a paid advertisement or a fake news site? – and engage them with assignments that help develop and enforce those skills. Students at American and Canadian universities are lucky. They have access to the worlds best libraries, the best teachers. But if we don’t teach them how to make use of that privilege, if we don’t teach them how to act and think like digital citizens, it means nothing. On Wikipedia, we are asked to imagine a world where every human being has equal access to the world’s knowledge. I invite you to join us in making that happen. If you’d like to learn more about teaching with Wikipedia, please email contact@wikiedu.org or visit teach.wikiedu.org. I’d be happy to talk more and to help you design the perfect assignment for your next course.